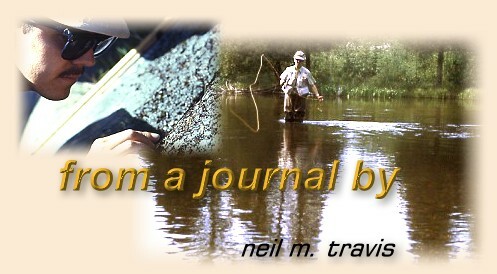 There are dry flies, wet flies, emergers, nymphs, terrestrials, and streamers, and during my years of fly fishing I have fished them all, but if you want to make this old angler happy as a clam in mud just put me on a trout stream during a major spinner fall. For the uninitiated, spinners are the final adult stages of the mayfly life cycle, correctly called imagoes by those with a more scientific bent, but to anglers they are generally known as spinners. This name likely originated when anglers observed the frantic mating flights where the males fly up and down, and when a female enters the swarm a male quickly grabs her and they spin downward in a mating spiral. Large flies or small I love them all, but if given a choice I will take small spinners, 18 or smaller, every time. In my angling playbook this is the crème de la crème of fly-fishing fun. While spinner falls may occur at any time of the day, during the warm months of summer when some of the heaviest spinner falls occur, the best fishing usually takes place in the golden hours between sunset and dark. Back in my younger days, when fishing until the stars came out was a task that I could easily accomplish on a regular basis, I would often be miles from home when the last fish stopped rising. In late June through mid-July in the northern latitudes it stays light until nearly 10 o'clock, and in our country it's not unheard of to drive 100 miles, one way, to spend a day fishing. If the spinners are falling, and the fish are rising I am inclined to keep fishing, and on more than one occasion it has been the wee hours of the morning when I have finally arrived home. Unfortunately, time has caused me to limit my excursions to areas closer to home, since I am not quite as good at dodging elk and buffalo on the road as I was in my younger days. Still I remember those huge spinner falls on the Upper Yellowstone River deep in the heart of Yellowstone National Park. From my doorstep to the Upper Yellowstone is approximately 100 miles by road, half of that within the Park itself. The best spinner falls occur just before dark during the first couple weeks of August, and most anglers have long since departed when the action begins. I recall one remarkable day when I arrived early in the afternoon, and lazed away the hours before twilight walking the banks and casting to an occasion riser. I could see the larger cutthroats holding in the deeper cuts and under the weed beds, but it was only the smaller fish that were rising to the occasional insect that floated overhead. I was on the big flat below Le Hardy Rapids, and as twilight approached the few remaining anglers packed up and left. Looking upstream and down I could not see another angler. As the sun struck the western peaks I looked up into the setting sun to see thousands of mayfly spinners dancing just above the trees, and in the gathering twilight I watched them descend toward the water. Suddenly the previously quiet stream surface was pockmarked with the noses of feeding cutthroats. The rise was so heavy that it looked like a rainstorm was passing over. The surface of the stream was covered with PMD [pale morning duns] spinners, and every cutthroat in the stream was gorging on this easy meal. For the hour and a half I was constantly fighting one good cutthroat after another, and there was not another angler anywhere around. The action was so intense that I failed to notice that a car full of tourists had pulled up to watch me fish. I hooked one especially feisty fish, and I waded to shore to bring it to net. One of the tourists came down to watch, and then he asked, "What are you using?" "A rusty spinner," I replied. "A rusty spinner?" he replied, "I thought this was flies only water?" I started to try to explain, but then another good fish rose.